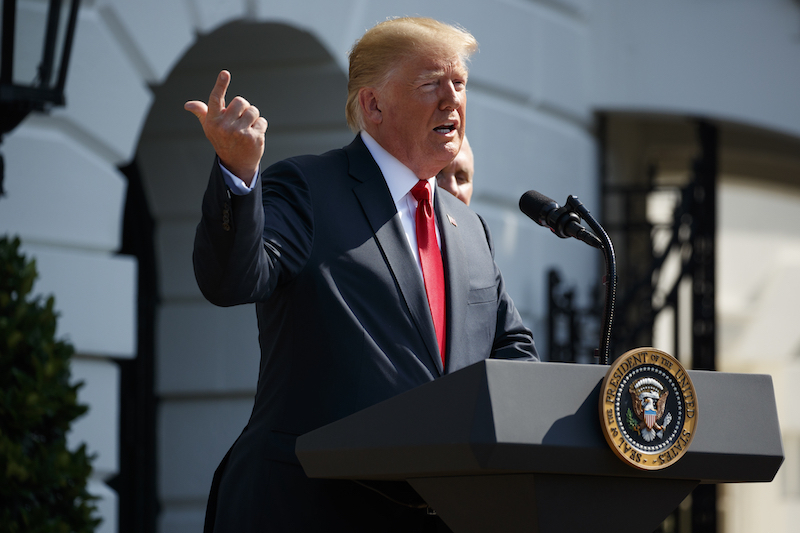 By Louis Jacobson on Friday, July 27th, 2018 at 4:13 p.m.
President Donald Trump campaigned hard on a promise to kick the economy into high gear and with the latest economic numbers, he had something to crow about. The economy grew at an annualized rate of 4.1 percent between April and June. Trump said the country was seeing proof of the power of his tax- and regulation-cutting agenda. Let’s take a look at some of his assertions and see whether they hold up. "In the second quarter of this year, the United States economy grew at the amazing rate of 4.1 percent." This is a strong showing in the context of recent history, and the highest since the third quarter of 2014. But most economists would not use the word "amazing" to describe it. Quarterly increases of at least 4 percent are not unheard of. That level was reached four times under President Barack Obama, including heights Trump has not yet reached, such as 4.6 percent (twice) and 5.2 percent (once). On two other occasions, Obama oversaw 3.9 percent growth. "These numbers are very, very sustainable." Independent analysts are skeptical about how long this growth spurt can last. "Unfortunately, this rapid growth is largely the effect of a one-time sugar high and is not representative of likely growth over the course of the next year, let alone the next decade," the Committee for a Responsible Federal Budget wrote after Trump’s remarks. The group cited a confluence of positive events in early 2018 that won’t be repeated indefinitely: the passage of a major tax bill in December 2017, a 13 percent bump in discretionary spending in the latest federal appropriations bill, and accelerated purchases of goods in advance of threatened Trump administration tariffs, notably soybeans. The pro-business Tax Foundation also injected a note of caution, writing, "A short time period is not sufficient to make conclusions about long-term policy changes." Growing at 3 percent for a full year is now in the realm of possibility for Trump, and if it happens, it would be an accomplishment. The last time the economy grew at 3 percent for an entire year was in 2005, when it grew at 3.3 percent. Read our more detailed explanation of why economists think 3 percent growth is unlikely over the long-term. "The year before I came into office, private business investment grew at only 1.8 percent. Last year, it jumped to 6.3 percent. … This year, it's growing at 9.4 percent, so that's a very tremendous increase." The math checks out. Between the last quarter of 2017 and the latest one, fixed investment went from $3.42 trillion to to $3.58 trillion. That’s a 4.7 percent increase for the first six months. If you assume that will continue, you can double it and you get 9 to 10 percent for the year. However, it’s worth noting that the rise in the first quarter of 2018 was 11.5 percent and in the second it was 7.3 percent. "It's definitely slowing down, but that was a pretty big leap in the first quarter," said Justin Fox, the editorial director of the Harvard Business Review. Indeed Hiring Lab economist Nick Bunker cautioned that these numbers will change as the data is refined and republished in subsequent months. "You don't want to get too nitpicky with the data, especially a first release," Bunker said. "This will get revised a few times and there are margins of errors and so forth." "We had lost almost 200,000 manufacturing jobs under the previous administration. … Since I was elected, we've added 400,000 new manufacturing jobs." The math is roughly right, but it needs context. Manufacturing jobs did decline by 192,000 under Obama, and since Trump’s election, they have increased by 373,000. However, Obama’s numbers look particularly bad because he took office as the Great Recession was in full force — a situation Trump, in his short tenure, has avoided. Once manufacturing jobs hit rock bottom in February 2010, they increased by 916,000 by the time Obama left office. The chart below shows that manufacturing employment did weaken slightly during the final three years of Obama’s tenure and began to increase early in Trump’s. So it’s not unreasonable for Trump to cite an uptick on his watch. That said, the rate of increase has been fairly stable since around 2010, regardless of the president in office. "We have added 3.7 million new jobs since the election, a number that is unthinkable if you go back to the campaign." Trump’s number is in the ballpark. If you use November 2016 as the baseline, almost 3.5 million jobs have been added through June 2018. This is a notable achievement, especially at the end of a long economic recovery -- the longer a recovery goes, the harder it is to keep up high rates of job growth. That said, "unthinkable" is the wrong word to use. The scale of monthly job gains under Trump (shown in red in this chart) are broadly in line with the scale of monthly job gains under Obama (shown in blue). "We are in the midst of the longest positive job growth streak in history." That’s correct. But as the chart above shows, a large majority of that job growth streak came on Obama’s watch. "We've accomplished an economic turnaround of historic proportions." There’s little question that the economy is in good health right now. But Trump is off-base when he suggests that this required a "turnaround." During the second half, or more, of Obama’s term, the economy was doing well, too. "African American unemployment is the best it's ever been in the history of our country." This was correct for May 2018, when it was 5.9 percent, but the rate ticked up again in June, to 6.5 percent. That’s still low by historical standards, however. "The Hispanic unemployment rate has reached the lowest level likewise in history." Trump is on safe ground here. The current 4.6 percent Hispanic unemployment rate is a record low. "The Asian unemployment rate has recently reached the lowest level, again likewise, in history." This statistic has only been calculated since 2003, so "in history" should be taken with a grain of salt. That said, the rate has been low, mostly hovering around 3.0 in the first half of 2018. That’s in the ballpark of past lows. Trump is probably referring to the 2.1 percent rate in May 2018, but that appears to have been a one-month blip that returned to 3.2 percent in June, the most recent month available. "Women unemployment rate recently reached the lowest level in 65 years." The current level is 3.7 percent. That’s certainly low by historical standards, but it was as low or lower than that for most of the time between August 1999 and April 2001. "Consumer confidence has reached historic highs." Consumer confidence is high at the moment, but it’s not at a record. The Conference Board’s Consumer confidence index was higher in the late 1990s and early 2000s.